October had a real Scottish flavour to it, but the filling as ever, was mouth-watering sports advertising! Just like everyone else, we entered October with the Ryder Cup fresh in our minds and still very much in awe of what we had watched. Golf is a tough game at the best of times and to see it played to that level, under that amount of pressure, is testament to the players on both sides. Thankfully this time the result went the way of Thomas Bjorn and his men….. Feeling inspired by the boys in blue, we headed to Gleneagles at the beginning of the month, for the Rangers Charity Golf Day and although effort levels mirrored those of our European heroes, ability levels fell somewhat short. It was fantastic to see the famous course first hand and we love working alongside and being involved with such a prestigious club as Rangers, so to share their charity golf day with them was a fantastic start to the month. We were lucky enough to get to Glasgow three times this month, to watch Steven Gerrard’s men take on Rapid Vienna and Spartak Moscow in the Europa League group stages, as well as the Betfred Cup semi-final v Aberdeen at Hampden Park. In one month, we managed to see three different faces of this current Rangers team. Fantastic against Rapid Vienna, not bad against Spartak Moscow and somewhat laboured in attack against the Dons. A good European run will undoubtedly give even greater reach for principal partners 32Red and although they didn’t reach the showpiece final of the Betfred Cup on this occasion, another game LIVE on BT Sport will help to increase brand awareness and exposure for the online casino giants. Scotland’s league cup has undergone a fair transformation since leading Bookmaker Betfred became Title Sponsors and ‘Semi Final Sunday’ was another innovation that attracted tremendous interest for the competition and the brand. Although the idea of playing both semi finals on the same day was forced on the SPFL, it made for an exciting day for Scottish football and a chance for Betfred to ‘own’ two of the world’s most famous stadiums in Hampden Park and Murrayfield, for the day. 32Red have shown real intent with their advertising campaign across the EFL Championship this season and having lent their name to the front of Preston’s kit, a resurgent PNE will do the brand no harm at all. Vanarama’s month long re-brand in partnership with Prostate Cancer UK was a roaring success throughout September and October and we were on hand at the LIVE BT Sport game between Halifax and Chesterfield to install and oversee the Manarama branding for the final time. Culminating on Non-League day and with PCUK’s Kevin Webber completing his 7 marathons in 7 days, the Manarama campaign had the fitting end it deserved, LIVE on BT Sport and all parties received excellent coverage throughout the month. 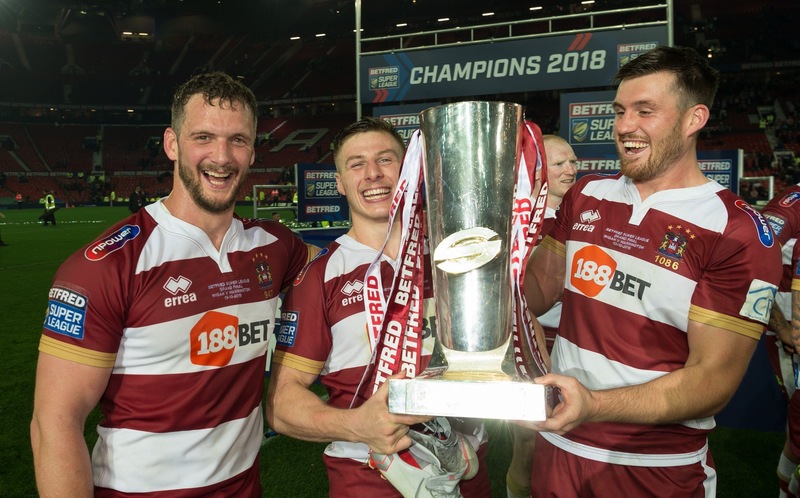 Rugby League had an unbelievable month as the Betfred Super League season drew to a close and you couldn’t move throughout October for Super League coverage across all forms of the media. First up was The Million Pound Game that saw London Broncos defy the odds and topple The Wolfpack on their own Toronto patch and book themselves a place in the 2019 Betfred Super League. Shortly after this was the Steve Prescott Man of Steel dinner, that saw the outstanding Ben Barba walk away with the main prize of the night. He was the benchmark from the second he set foot in St Helens and being named the 2018 Man of Steel was a fitting end to his time in Super League. Then it was the turn of the big one. Wigan met Warrington at Old Trafford to see who would be crowned 2018 Super League champions and although it won’t be remembered as a classic, the 188BET sponsored Warriors had too much at both ends of the field in the end and sent Shaun Wane off into the sunset with another trophy, to end a glittering thirty years in Wigan. Seeing Old Trafford dressed in Betfred branding is a great lasting memory of the Super League season and we were also delighted to provide our friends JASIC with an outstanding presence on the perimeter advertising throughout Rugby League’s showpiece event, LIVE on Sky Sports. The Vitality Roses are gearing up for the 2019 World Cup in Liverpool and the tournament seems more real with every passing day. England Netball and Vitality have agreed to extend their partnership in one of the biggest ever deals for women’s sport, in the midst of a busy month for the girls, giving the game and all stakeholders brilliant coverage throughout October. A depleted England team were beaten by Jamaica over a three-game series and didn’t have much better luck in the Fast5 tournament either, having beaten Australia and South Africa over the two days, but ultimately finishing fifth overall. Playing against high quality opposition will stand the Roses in good stead for the summer and even though results didn’t quite go for them on this occasion, it’s all part of the preparation for the big one in July 2019. October was full on and the sports advertising ball kept rolling as it always does here at Sports 360. We managed to avoid any Halloween dramas, but we can guarantee fireworks in November!